While walking through Amsterdam's Schiphol Airport in November 2000, I stopped in one of the duty-free shops and saw this radio. 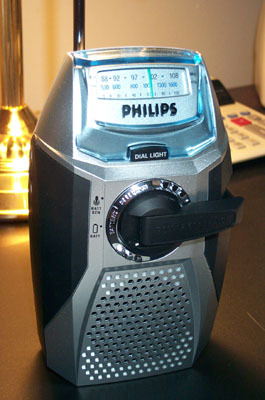 The Philips AE1000 is an MW/FM receiver which the manufacturer describes as a "Free-Powered Radio." At first glance, it would seem similar to the Baygen Freeplay radios from South Africa, but closer inspection reveals something else. Whereas the Baygen units use a wind-up mechanism that causes a mainspring to turn a built-in generator (thus offering truly battery-free operation), the AE1000 uses two AAA NiMH rechargeable cells built into the unit, and the wind-up mechanism operates a charging system which refreshes the charge in the cells. The net result of both is, of course, radios that do not need regular batteries, but the fact is that at some point the rechargeables in the Philips will burn out and they will have to be replaced. Whether or not this is an issue to the average consumer is really up to the specific user. The most obvious feature of the radio is the fold-out crank in the center on the front of the unit. The user is to turn this crank at an appropriate speed (you know you are at the right speed when a "Charging" LED on the top of the unit lights) for 1 minute for each 30 minutes of playing time. My unit was fully charged; after playing the radio for about 20 minutes right out of the box I did the one-minute drill and the radio ran for over 3 hours of continuous use. Philips says that you can charge the batteries up to one hour at time, translating to 15 hours of continuous use. I could not imagine turning the crank for sixty minutes, but I suppose if you're in the woods and bored it would be something to do. The chrome ring at the hub of the crank also servers as a power selector switch. The user can select as a power source the built in rechargeables or two AA batteries which can be installed in a conventional battery door at the back of the unit. The 2-inch speaker provides typical transistor-radio audio quality. Above the crank is a dial light button, which is really of dubious value. The actual light sources (two LEDs) are so far from the dial scale that they serve no purpose other than to give the face plate of the unit a cool glow. The dial scale runs from 88 to 108 MHz FM and 530 to 1600 kHz MW. The highest station I can receive on this unit is a local TIS (Traveler's Information Service) station at 1610 kHz. Philips sold a version in North America called the AE1000-17 which tunes the Medium Wave band from 530 to 1710 kHz. Toys 'R' Us retail stores carried this version of the radio in their electronics department. As one would expect, the calibration on the dial is not precise. WBBM (780 kHz) comes in at around 800 on the scale. The left side of the cabinet has the power/volume control thumbwheel. The right side has the FM/AM band switch (surprisingly marked as such, since the dial scale says "FM/MW") and the tuning control. On top of the radio we have a "Tuning" LED which lights when a station is received and next to it, the aforementioned "Charging" LED. There is also a non-pivoting telescoping antenna for FM reception. Interestingly, there is no headphone/earphone jack anywhere on the unit. From a performance standpoint, this radio is a bit disappointing. It receives most of my local AM and FM stations without too much trouble, but there is a real problem with "ghosts" and splattering across both bands. I live near the transmitters for both WBBM (780 kHz) and WGN (720 kHz), and they appear all across the dial on this radio. On the FM side, local stations WKIE (92.7 MHz) and WYLL (106.7 MHz) appear in several spots on the FM band. None of the other radios in my collection suffer from this problem this badly. In all, this is a neat little radio with a very interesting concept. The AE1000 makes for a nice conversation piece, but for serious listening it would make more sense to use a different unit. I paid NLG 67.50 (about € 30 or US$ 26) at the duty-free shop. Over the years I've seen other versions of this radio sold under other names in places such as Walgreen's as recently as 2010. I sold this radio to a buyer on eBay who lives in Florida.